Mayor John Cranley presents Christine Vachon (at right) before last evening’s event. Film Cincinnati executive director Kristen Schlotman moderated the panel. Christine Vachon says her job as a movie producer is like the engine on a train that keeps a film project moving. With her production company Killer Films, Vachon has been the “little engine that could,” bringing more than 100 movie projects to the screen. 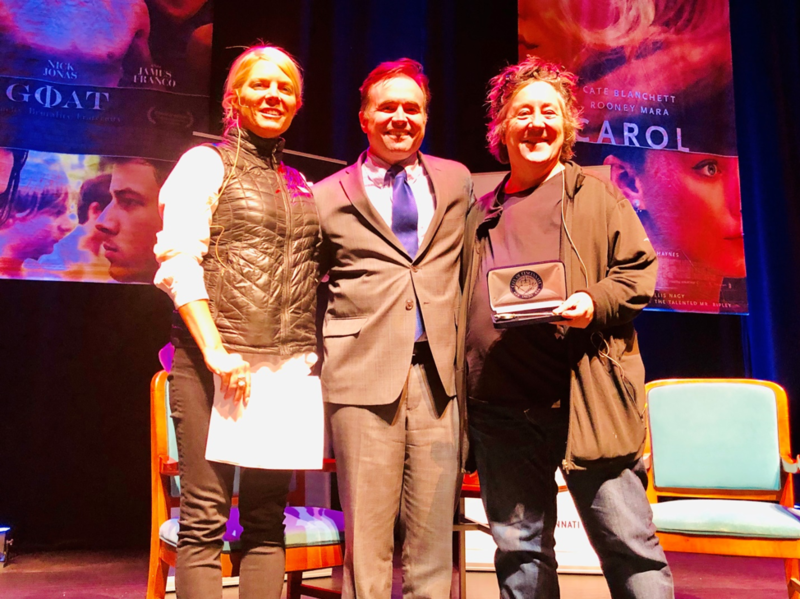 Vachon was Film Cincinnati’s special guest Wednesday night, March 6, at 7 p.m. in the Jarson-Kaplan Theater at the Aronoff Center for “An Evening with Christine Vachon” and discussed her career and the ins and outs of the movie business. Vachon, along with her business partner Pamela Koffler, founded Killer Films in 1995 and have produced such movies as Boys Don’t Cry, Far From Heaven and Still Alice. But over the last few years Cincinnati has become almost a second home for Killer, shooting such movies as Carol, A Kind of Murder, Goat and My Days of Mercy here. Vachon says picking Cincinnati for a film location is an easy choice for a producer. “When we came with Carol, we really discovered that there was an ability to recreate 1950s New York here that seems very unique,” she said. “As people in Cincinnati are well aware, there’s a similar, but on a much smaller scale, grid system downtown. We even scouted the Cincinnati subway for another movie and even though it’s falling apart, you can see it was modeled after a New York subway. “So that was what brought us here originally. And then what really kept us here was because Kristen (Schlotman) and her office at Film Cincinnati work so beautifully with productions in terms of easing their way, helping you figure out what makes sense pragmatically and creatively. That’s a tremendous asset, and it’s hard to quantify, but it’s not just about saving money but it’s the ease of the experience. Vachon currently is in Cincinnati with the crew of Dry Run, directed by her friend Todd Haynes, whom she has known since their days at Brown University. She and Todd have worked together on a number of other projects, including Carol, Wonderstruck and I’m Not There. Vachon’s films have won Oscars (Boys Don’t Cry and Still Alice) and Independent Spirit Awards (Far From Heaven). She has had movies at Cannes, at Sundance and at the Toronto film festival, among others. But she says the most satisfaction she gets from her films, comes from the local movie theater. “Film festivals are one thing,” she said, “premieres are another thing, and they’re great, but what’s really a celebration for me is the first time a paying audience sees a film and appreciates it.